If radiation was visible, if radiation was red dots, this is how it would really look like. This movie was played at the event on peace and radiation held at a high-school in Harlem, NY, on December 2, 2011. Misato Yugi is a super-hyper-positive artist whose "red dot" radiation drawings have become widely known in post-Fukushima Japan. But the video is rather disturbing. I stopped when a small child is made to sit in front of the heap of red dots, and a fork and a knife materialize in her hands, with black figures towering over her. Just like Koriyama City schools and elsewhere, force-feeding children with food as long as the radioactive material density is below the provisional safety standard. Sorry to bother you with another "high-tech" decon strategy coming out of Japan that makes you doubt the collective intelligence of the people in that island nation. Fukushima Prefecture officials are ready to call "engine bloomer" - a leaf collector - as a powerful tool to decontaminate. The prefectural government of Fukushima tested the decontamination technology to effectively collect fallen leaves on the lawn on December 9 in Shirasakanomori Sports Park in Shirakawa City. The government is testing the effectiveness of various decontamination technologies in several locations in Fukushima. On December 9, they tested the German-made leaf collector proposed by a landscaping company in Shirakawa City. The leaf collecter is called "Engine Bloomer" which uses a rotating plastic brush to scrape leaves off the lawn. It has a big collecting power without damaging the trees, and it may be effective in decontaminating the lawn and orchards. In the test, the president of the landscaping company removed the dead leaves on the lawn using the "Engine Bloomer". The radiation level 1 centimeter off the ground was 0.44 microsievert/hr before the test, which dropped to 0.24 microsievert/hr after the test. The Fukushima prefectural government will ask the decontamination advisor of the prefecture to evaluate this technology, and plans to make it public. So, a leaf collector, by virtue of collecting the dead, radioactive leaves off the lawn, is called "decontamination technology". Just like a high-pressure washer is called exactly that because it washes the roof and the wall contaminated with radioactive materials. Fukushima Prefecture's decon advisor is none other than Shunichi Tanaka, former Deputy Commissioner of the Nuclear Commission. The last I saw him on a Youtube video, he was telling the decon volunteers in Date City in November to use their own judgment whether to put on masks because the local residents didn't dress like these volunteers. Don't alarm the residents, he was basically saying, even though he was there to ensure the volunteers were protected from radiation exposure. Now, you may ask why Fukushima Prefecture is doing all these bizarre "decon" experiments. Answer: to retain the residents. Why? Because if the residents move out of Fukushima permanently (i.e. removing the resident registers to other prefectures) the prefecture will lose grants from the national government, which are based on the number of residents in the prefecture. Less residents, less money for the Fukushima government. Less money for the government, less power for the politicians. Four commissioners of the US Nuclear Regulatory Commission sent a letter to the White House accusing Chairman Greg Jaczko of bulling and intimidating staff and experts. There are 5 commissioners including Jaczko. The US the House Oversight and Government Reform Committee will have a hearing on December 14. The 4 commissioners expressing "grave concerns" with Jaczko are Commissioners George Apostolakis, William Magwood IV, William Ostendorff and Kristine Svinicki. It looks like a political infighting, as usual, and the issue is over the Yucca Mountain nuclear waste site, in particular. I don't know much about this chairman, but he sure made the right decision in advising American citizens living in Japan to move out of 80-kilometer radius from the nuke plant. The chairman is still expected in Japan on December 18 for the joyful occasion of declaration of "cold shutdown" at Fukushima I Nuclear Power Plant by the totally corrupt and inept Japanese national government. I don't know what these commissioners are complaining about. Chairman Jaczko has said there is no need to tighten any regulation in the aftermath of the Fukushima disaster because it was a five-sigma event. Nuclear power plants are safe, and radiation is good for you. Dec. 10 (Bloomberg) -- U.S. Nuclear Regulatory Commission Chairman Gregory Jaczko is causing “serious damage” to the agency and is “creating a chilled work environment,” his four commission colleagues said. Jaczko has bullied career staff and attempted to intimidate an independent panel of technical advisers, the other NRC commissioners said in an Oct. 13 letter to White House Chief of Staff William Daley, released yesterday by Republicans on the House Oversight and Government Reform Committee. Jaczko responded that the commission's majority has “loosened the agency's safety standards” over his opposition. The exchanges bring into the open tensions and conflict within the agency that is responsible for regulating the 104 commercial reactors in the U.S. and is considering applications for a new generation of power plants. The NRC commissioners are scheduled to testify before the committee, led by California Republican Darrell Issa, about the rifts on Dec. 14. “There is no chilled work environment around me,” Jaczko said in a Dec. 7 letter to Daley. “I have never attempted to intimidate” the technical advisory panel, and “I do not ignore the will of the commission on policy matters,” he said. “Unfortunately, all too often, when faced with tough policy calls,” the commission majority “established policies that have loosened the agency's safety standards,” he said. Jaczko wasn't open with colleagues about his intent to stop work on a proposed waste site at Nevada's Yucca Mountain, according to a June report from the NRC's inspector general. Republicans have accused Jaczko of stopping work on the Yucca project for political reasons, which he has denied. President Barack Obama has moved to halt the project. Jaczko is a former aide to Senate Majority Leader Harry Reid, a Nevada Democrat who led opposition to the Yucca site. Jaczko's opponents are waging a “politically motivated witch hunt against a man with a proven track record of ensuring that nuclear power is produced as safely and responsibly as possible,” Adam Jentleson, a Reid spokesman, said in an e- mailed statement. A report released yesterday by Representative Edward Markey of Massachusetts blamed the four commissioners for trying to impede Jaczko's response to Japan's nuclear crisis in March. They “conspired, with each other and with senior NRC staff, to delay the release of and alter” an agency task-force study on the crisis, according to the 22-page report. It is based on documents submitted by the commissioners in response to an October request from Markey, the top Democrat on the House Natural Resources Committee. Jaczko, a former congressional science fellow for Markey, has urged the NRC to move quickly in implementing the task- force's recommendations to improve safety at U.S. reactors after an earthquake and tsunami caused radiation leaks and meltdowns at Tokyo Electric Power Co.'s Fukushima Dai-Ichi nuclear plant. Watari District, where rice with radioactive cesium exceeding the national provisional standard has been discovered, where Professor Yamauchi of Kobe University has said again and again that "decontamination" didn't work and that it even increased the contamination. I hear it is a very popular place for springtime cherry blossom viewing and partying, with hundreds of thousands of tourists each year visiting the place. Faced with another dismal season, the owner of the land where the trail to the mountain starts decided to "decon". On December 10, a decontamination experiment was conducted at "Hanami-yama" [cherry blossom viewing mountain] in Watari District of Fukushima City, in preparation for the next year's viewing season. The place is famous for cherry blossoms, with about 300,000 tourists visiting each year. However, this year, the number of tourists dropped dramatically to only 94,000 because of the March 11 earthquake/tsunami and the Fukushima I Nuclear Power Plant accident. It is located in the mountains and the radiation levels are relatively high. So the owner of the land where the trailhead to the mountain is located asked a firm in Sasebo City in Nagasaki Prefecture to decontaminate. The firm is noted for its asbestos countermeasures. The work was done around the trailhead. The workers sprayed the ground with the liquid solution made of sulphur and lime ("ND Lock" solution) mixed with barium sulfate. It is said that the solution is effective in lowering the radiation levels and preventing the dispersion of radioactive cesium. A 56-year-old director of a company that does decontamination work in the city says, "If it is shown that the solution lowers the radiation levels, I would like to use it to decontaminate mountains and forests. Mountains and forests. Good luck with that. On second thoughts, as long as he gets a lucrative contract from the city or from the prefecture, I guess that's all that matters to him, regardless of whether the true "decon" (=removing radioactive materials) is achieved. According to the manufacturer of the "ND Lock" (ND stands for "no detect"), the solution is used for asbestos treatment, and is the anti-dispersion solution for asbestos. What this has to do with lowering the radiation or preventing the dispersion of radioactive cesium, I have no idea. But in a "bubble", anything goes, and that's one definition of a bubble - anything goes. and the radiation contour map version 5 have arrived. And after the reprimand, the professor seems more invigorated than ever. Professor Yukio Hayakawa, irascible and irreverent (at least on twitter) volcanologist has been formally reprimanded by the president of his university (Gunma University) who happens to have a strong tie (the president is on the right side of the photo, at the link) with the Japan Atomic Energy Agency (JAEA), and the professor seems invigorated more than ever. As if to send a message to the president of the university, small private donations from people who have followed Hayakawa are pouring in to the university's coffer specifically to support Hayakawa's work, to the surprise (and probably dismay) of the university and amusement of the administrative staff. Hayakawa himself seems to consider the whole incident is such a great opportunity that has finally arrived - to reach people in Fukushima. For the first time, a Fukushima local newspaper reported on him as someone who is "insulting our farmers". Hayakawa, on learning about the newspaper coverage, wrote on his tweet: "Hurray! Finally! I'm reaching people in Fukushima!" From what I have read, people in Fukushima, despite this Internet age, have been insulated from the reality thanks to the very selective coverage of the local media (newspapers, TV). It is only recently, it seems, that the reality is dawning at least on some of them that they are in deep trouble. Hayakawa was telling the Fukushima farmers in March and April, "Don't grow vegetables, don't plant rice, because they will be so radioactive. Look at the radiation map I made." During summer, he was calling for mowing down the rice fields, and calling the farmers who grew rice in the highly contaminated areas in Fukushima "killers" who were growing "poison rice" (rice with radioactive materials) just so that they get compensated. On twitter and blog, unfortunately. But up until December 8, the media, both mainstream and alternative, completely ignored him. Why? Probably because he is an "outsider". He is a geologist and volcanologist, not a radiation expert or nuclear scientist. He may know much, much more about how super-minute particles may behave and spread than the nuclear physicists who have been paraded on TV since March 11, but he doesn't know anything about radiation or nuclear reactor, does he? And where is he, at Gunma University? A national university for sure but with no name, like Tokyo U or Kyoto. Not even Tohoku or Nagasaki. He does not fit in, and that's what irritates many people in Japan. Gunma University was so irritated, in fact, that it disallowed the use of electricity in his office during the press conference (link in Japanese) on December 8. The press conference was done without light and heat, in a dim light from outside. One reporter's camera ran out of battery. #Fukushima I Nuke Plant: NISA Admits to 7 Tonnes/Hr Water Leaked from RPV? Partly because of distrust of anything that comes out of the mouth of any TEPCO/government person, but also because of a TEPCO video in which Yoshida appeared to explain to the viewers the then-current situation at Fukushima I Nuclear Power Plant. They think they see a bulge on the left side of his neck, and they think it is either thyroid or lymph node. Here's one of the threads captured at "Hanayu" blog. Also, he slept at the plant in the early days of the accident, and the radiation inside the building was particularly high back then, with radioactive materials thick in the air from the hydrogen explosions because the doors and windows didn't close well. This tweet has a photograph of a thyroid cancer patient at the Organization of National Hospitals. of the TEPCO/Japanese government roadmap. Chairman Jaczko will be there to give blessings to the declaration of "cold shutdown" of the broken reactors at Fukushima I Nuclear Power Plant. It has been disclosed that the US Nuclear Regulatory Commission chair Gregory Jaczko may visit Japan and tour Fukushima I Nuclear Power Plant for the first time since the accident in mid December, when the Japanese government and TEPCO are scheduled to announce the achievement of "cold shutdown" whereby the temperatures of the reactors remain steadily below 100 degrees Celsius. According to the sources, Chairman Jaczko is scheduled to visit Japan from December 18, around the time the Japanese government and TEPCO are set to announce that the "cold shutdown" has been achieved at Fukushima I Nuclear Power Plant and that "Step 2" of the roadmap toward winding down the accident has been achieved. During the visit, Chairman Jaczko will visit the plant for the first time since the accident to survey the current condition and speak with the plant people. He will also meet with high ranking officials of the government. The US NRC sent a team of experts to provide constant support after the March 11 disaster, and the chairman will discuss with the Japanese officials about the tasks beyond "Step 2", which includes more accurate assessment of the condition inside the reactor and the safe removal of remaining fuel, and see if the US could help Japan in some way. It is said that the NRC wants to have more detailed information on the condition right after the accident started, and is likely ask Japan for more information disclosure. Even after Fukushima, Chairman Jaczko seems to think there's no need to change anything in the US, as the event like Fukushima will be so rare. I guess he hasn't heard of the chaos theory or a black swan event. Nor was he aware that a black swan event, or a fat-tail event, or five sigma event, did happen in 2008, bringing down the global financial system. Another five sigma is looming in Europe. Or simply an old adage, "When it rains it pours." TEPCO is disclosing the condition of Masao Yoshida, ex-plant manager of Fukushima I Nuclear Power Plant, at the request of Yoshida. The live feed was cut off at Yasumi Iwakami's channel. Will try TEPCO's live feed if it's there..
TEPCO's press room is near-empty. And the short presser is over now. TEPCO is smarter than you think. By deferring the decision on what to do with the treated water at Fukushima I Nuclear Power Plant, TEPCO will be able to dump it in the end anyway, when the storage tanks becomes full by March next year. Wait till the last minute, like it did with the first dumping of low-contamination water in April, and TEPCO can plead to the government that there is no other choice. The government will approve the dumping, with regrets, telling citizens that there is no other choice, and claim it will have obtained permission from countries that may be affected. The chief cabinet secretary will no doubt on hand to say there is no immediate effect on marine life, no immediate effect on human life, just like the previous cabinet secretary said. TEPCO has been considering the release of water treated to remove radioactive materials at Fukushima I Nuclear Power Plant into the ocean, after further treating it to reduce the remaining radioactive materials. However, faced with the protest from the fisheries cooperative associations, the company has deferred the decision on whether to release the water or not. At Fukushima I Nuke Plant, the contaminated water in the reactor/turbine building basements are treated and recycled to cool the reactors. However, groundwater has been leaking inside the building, creating more contaminated water than initially anticipated. According to TEPCO, it is difficult to stop the inflow of groundwater, and there is much excess water even after recycling. By March next year, the storage tanks with total 160,000 tonnes capacity may become full, the company says. TEPCO has been considering the release of the water after treating further to reduce the remaining radioactive materials to drop the density of radioactive materials below the national standard. The plan was to be included in the operational plan of the plant for the next 3 years which was submitted to the Nuclear and Industrial Safety Agency on December 8 evening. However, due to the protest from the national federation of fisheries cooperative associations demanding the company not to release the water into the ocean, TEPCO didn't include the issue of the treated water in the operational plan, and deferred the decision on the release of the water into the ocean. TEPCO's spokesman Junichi Matsumoto says, "We couldn't decide on what to do with the treated water. We should make a decision soon, but we will consider various opinions carefully." 400 tonnes of groundwater is flowing into the building basements per day. 12,000 tonnes per month. 144,000 tonnes per year. I have a better idea than dumping the treated water into the Pacific Ocean. Bottle it and sell the bottles, naming it, say "Fukushima Pure" or something. It should be a smashing success with people who are eager to obtain radiation hormesis effect. Lifetime supplies to Doctors Rockwell and Allison, Guardian's Monbiot who came to love nuclear power because of the Fukushima accident. Minister of the Environment Hosono and his sidekick Sonoda can have them too. 100 million becquerels per liter of radioactive strontium and plenty of tritium. Mmmm. Goodbye Hokkaido. Goodbye Japan, on its time-tested path of self-destruction. The Tomakomai City committee for safety unanimously voted down the petition asking the city not to accept the debris. What's next, residents? The special committee for safety and security of the Tomakomai City Assembly was held on December 8, and the committee voted down unanimously the petition not to accept the disaster debris from the March 11 earthquake/tsunami. The City Assembly thus made it clear that it supports the city government's willingness to accept the disaster debris. In the question and answer session, Vice Mayor Kazumi Kikuchi said about the petition that called for refusal of the debris regardless of the radiation standard, "Basically, my impression is that we have different ideas." He emphasized the city's position that it will accept the debris as long as it is safe and secure. Board of directors [a panel of experts??] commented on the standard in the wide-area disposal guideline set by the Ministry of the Environment that if the density is 100 becquerels/kg of radioactive cesium and below, it is not considered as radioactive material. "It is not possible to have zero radiation [in the debris]. Ultimately, 100 becquerels/kg [of radioactive cesium] could be used as one standard, since it is already specified in the waste disposal law." The committee members asked about the effect on the environment when the ashes from the debris with 100 becquerels/kg or less of radioactive cesium are buried. Board of directors explained that the structure of the incinerators at two locations in Tomakomai City is such that the fly ash and the bottom ash are not separated. They added, "The level of radiation [of the ashes??] would be lower in Tomakomai. We don't think there will be any effect on the atmosphere after the ashes are buried" if the radiation standard is observed. As to the concern over [the radiation on] the ashes, Vice Mayor Kikuchi said, "We cannot experiment by burning (the debris) in Numanohata District [where they plan to burn the debris]. The Hokkaido government is sending officials to Tokyo to investigate. We will wait for the result", indicating the city will decide based on the data from Tokyo. So, they really don't know how radioactive the debris is, their incinerators don't even separate fly ashes and bottom ashes, they think 100 becquerels/kg of radioactive cesium in the debris is safe. 100 becquerels/kg of cesium in the debris will result in 3300 becquerels/kg of cesium in the ashes. Hokkaido's contamination from the Fukushima accident is low to ND so far, and yet the officials who run the show think nothing of burying the ashes that have 3300 becquerels/kg of cesium. To help Iwate, Miyagi and Fukushima. Right. The adjacent city north of Tomakomai, Chitose City, is opposed to accepting disaster/radioactive debris. It doesn't matter much, does it, if the city right next to it is burning the debris? according to the analysis by the Fukushima prefectural government. Regarding the amount of external radiation exposure suffered by the residents of Fukushima Prefecture as the result of the Fukushima I Nuclear Power Plant accident, the analysis by the prefectural government has revealed that it is estimated that the amount is 37 millisieverts maximum with the average of over 1 millisievert for 1730 residents in 3 municipalities with high radiation levels including Iitate-mura. About half of the residents had over 1 millisievert external radiation exposure in 4 months. The annual radiation exposure limit [excluding the natural radiation] is 1 millisievert. This is the first time the external radiation exposure of the residents [of Fukushima] is disclosed. The Fukushima prefectural government plans to publish the result of the analysis soon, and notify the residents by mail. The prefecture and Fukushima Medical University (whose vice president is that Dr. "Damashita" Yamashita) sent out detailed questionnaires for the Fukushima residents to fill out. For the residents of the three municipalities - my guess is Iitate-mura, Namie-machi, and Minami Soma City - they did some testing of internal radiation exposure. By no means this analysis is comprehensive, as Iitate-mura alone had 6,000 residents before the village was designated as "planned evacuation zone". Not just the Suppression Chamber of Reactor 2, as even TEPCO admits is broken from unknown causes. Analysis of the hydrogen explosions at Fukushima I Nuclear Power Plant accident has revealed the possibility that the Suppression Chambers of Reactors 1 and 3 are damaged. Professor Takashi Tsuruda of Akita Prefectural University reported in a symposium [Combustion Symposium] held in Yokohama City on December 7. According to the analysis by Professor Tsuruda, something that appears to be saturated steam that contains fission products is observed to escape from the reactor building after the explosions of Reactor 1 and Reactor 3. From this, Professor Tsuruda has concluded that the Suppression Chambers [for these reactors] are likely to have been damaged by the hydrogen explosions. Professor Tsuruda says, "The water in the Suppression Chambers is the most likely source of this much water." He says a simulation experiment would be necessary to further examine the explosions. From his profile, Professor Tsuruda's specialty is reaction chemistry, and the study of combustion in particular. He was reprimanded by the university president for his "insensitive and inappropriate" remarks about "disaster victims" in Fukushima on his Twitter and blog, and is threatened with "disciplinary measures" that include termination from his position. There are four types of "disciplinary measures" for public employees like Hayakawa: termination, suspension without pay, pay cut, and reprimand. He already got the last one. He is the one who put out the radiation contour map from the very early days of the disaster. He is very much politically incorrect, not afraid to say things as they are. Professor Hayakawa tweeted the entire reprimand live, after warning the university that he was tweeting live. Hayakawa decided to hold a press conference this afternoon (December 8), changed his mind and decided to have an open lecture instead and booked the classroom. The school disallowed his booking, because the reservation didn't go through the proper channel. So he decided to have an open house in his office. Then the head of the department came and forbid him to have an open house in his own office, but somehow that must have gotten resolved, and Professor is speaking with the media. Tokyo Shinbun, Kyodo News, Yomiuri, TBS, and IWJ (Yasumi Iwakami) are there right now, live on USTREAM, here. #Radioactive Debris: New Osaka Governor to Citizens - "Don't Interrupt!" 47-year-old Ichiro Matsui is the newly elected governor of Osaka Prefecture who is all for accepting the disaster (and radioactive) debris from Tohoku. He convened the first meeting of experts to decide on the guidelines for accepting the debris, but the meeting was "rudely", according to him, interrupted by the citizens who don't want any radioactive debris to be burned and buried in Osaka. The meeting was canceled after one hour. The governor was so incensed at this inappropriate behavior by the citizens who were supposed to just observe the meeting that he decided to keep the citizens in a separate room next time and make them watch the live feed of the meeting so that they don't interrupt the meeting with their silly questions about radiation. The ex-governor of Osaka, 42-year-old Toru Hashimoto, is also very eager to accept debris. Now that he has become the new mayor of Osaka City, he and Matsui (they are of the same party called Osaka Restoration Association) want to push hard for the radioactive debris brought to Osaka. Pesky citizens be damned. Regarding the acceptance of disaster debris from the March 11 earthquake/tsunami, the Osaka prefectural government held a meeting on December 7 of experts to decide on the guidelines of debris disposal within the prefecture. But the meeting was disrupted from the citizens who were observing the meeting and spoke up against the acceptance due to the concern for the effect of radioactive materials, and it had to be abandoned after about one hour. Governor Ichiro Matsui, who has already expressed willingness to accept the debris, was very displeased, and said "I don't think it was appropriate for [these people] to interrupt the meeting that discussed scientific knowledge. He plans to have the citizens observe the meeting in a different room via the [live] monitor. According to the prefectural government, citizens who were against accepting the debris spoke up one after another, asking to know whether there would really be no damage to health. Remarks from the observers are not allowed. Professor Takao Yamamoto of Osaka University, who was the chairman of the meeting, and others decided that the meeting couldn't proceed in an orderly way, and canceled the meeting. Acceptance of disaster debris in Osaka was first expressed in May in the prefectural assemby by the then-governor and soon-to-be mayor of Osaka City Toru Hashimoto. Governor Matsui also says, "If the safety is confirmed, we should accept the debris to help the victims of the disaster." According to the guidelines for processing the debris that are to be discussed in the meeting, the debris with the density of radioactive cesium of 200 becquerels/kg will be first sorted and crushed in the disaster areas, then it will be put in sealed containers and brought to Osaka by ship. After landing in Osaka, the debris will be further sorted and crushed by private companies that has the facilities to prevent the escape of radioactive materials. Then it will be transported to municipal and private waste processing plants and burned. Before burying the ashes, the density of radioactive cesium is to be measured and it should be less than one-quarter of the national safety limit. The Osaka government had planned to decide on the guidelines before the end of this year, and to start negotiation with the disaster-hit prefectures and with the municipalities in Osaka that have incineration plants. However, almost all of 10,000 messages received at the government are against accepting the debris. Coupled with the cancellation of the meeting on December 7, it looks difficult to decide on the guidelines before the end of this year. Just like Tokyo. Osaka will burn the radioactive debris in the municipal incineration plants all over Osaka. These criminal people are duly elected. Viva democracy. Debris with 200 becquerels/kg of cesium will burn to produce ashes that may have 6600 becquerels/kg of cesium (33 times concentration). I don't know what national standard they are talking about, but assuming it is 8000 becquerels/kg that is decreed "safe" for burying in the landfill by the Ministry of [Destruction of] the Environment, Osaka's ashes will be too radioactive to bury with abandon. Well I suppose they can simply mix and match and burn to lower the radioactivity. One of my twitter followers from France sent me a link to a French blogpost titled "Christmas in Fukushima". JR (Japan Railway) apparently has a special PR blitz that pushes Tohoku - Yamagata, Aomori, Akita, Iwate, Miyagi and Fukushima as travel destination. It has launched a TV commercial featuring young women having a good time traveling in the region. The color scheme of the ad seems intentionally "dated" - it has a 1930's look to me. The first ad has a woman posing as if she was either shielding her eyes or saluting military-style. At JR East's website, you can download an ad poster for your favorite prefecture in Tohoku. As the French blog points out, the ostensible (or "tatemae") reason for the PR blitz is to commemorate the 1 year anniversary of Tohoku Shinkansen (bullet train) between Tokyo and Aomori), while the real reason is likely to be to prop up the sagging ticket sales and "help" the tourism industry in the disaster-affected area. I personally do not think JR should be promoting tourism using young women in an area severely affected by the fallout from the nuclear plant accident. I don't think young women like those in the TV ad below should be in Fukushima for fun, but it's just me. Learned experts clearly have different opinions (here and here). #Fukushima I Nuke Plant: 220 Tonnes, not 45, of Strontium-Contaminated Water? If you look at the photos released so far by TEPCO (see my posts here and here) while being told only 45 tonnes of treated water leaked from the evaporative condensation apparatus (desalination) at Fukushima I Nuclear Power Plant and that only 150 liters (about 40 gallons) of it leaked into the ocean, and wonder "45 tonnes? 150 liters? The numbers look too low", you may be right. The amount of water leaked from the apparatus may be 220 tonnes, not 45 tonnes as widely reported. In this case, one of the first reports by Asahi Shinbun (print/digital print version) may have gotten it right. 45 tonnes just inside the building that houses this apparatus. Let's do some recalculations. 150 liters of the treated water that have leaked into the ocean, according to TEPCO, had 26,000,000,000 becquerels (26 billion becquerels) of radioactive materials (cesium, strontium, etc.). If 750 liters leaked instead (using the ratio of 220 tonnes to 45 tonnes), 130 billion becquerels. If one tonne (1000 liters) leaked, about 173 billion becquerels. TEPCO announced on December 4 that 45 tonnes of water was found leaked at a facility to treat the highly contaminated water at Fukushima I Nuclear Power Plant. The water has been treated, but it contains radioactive materials that far exceed the level allowed by law. The total amount of the water leaked is estimated to be 220 tonnes maximum, and part of it may have leaked into the ocean. TEPCO has said that "cold shutdown" of the reactors will be achieved soon, but this incident shows that there are problems in the restoration work. This is the largest leak from the circulatory water injection and cooling system since the system started [in June]. The density of radioactive cesium in the water is 45,000 becquerels/liter, 300 times the density allowed by law for the water to be released into the ocean. The density of radioactive strontium is not yet available, as it takes time to measure. But judging from the previous data, it is considered to be 100 million becquerels/liter, 1 million times the density allowed by law. TEPCO has stopped the operation of the apparatus, but the injection of water into the reactors continue, as there are more than 10,000 tonnes of treated water in the storage tanks. TEPCO says, "It won't affect the cold shutdown." According to TEPCO, a worker at an affiliated company [subcontractor] found the leak from the apparatus that desalinate the water at about 11:30AM on December 4. 45 tonnes of the treated water leaked from the apparatus, and the water was found leaking from cracks in the [concrete] near the floor into the side drains outside. The leaks were stopped by sandbags. "It looks like 220 tonnes, not 45 tonnes, that leaked.."
The American Spectator Magazine: "Let the People of Fukushima Go Home and Get Back to Work"
In an article written by Dr. Theodore Rockwell and posted on December 6, 2011, the conservative monthly magazine says "Let the People of Fukushima Go Home and Get Back to Work: The science doesn't support the panic". For a moment, I thought I was reading Professor Wade Allison of Oxford University. "other people are living carefree in places like Norway, Brazil, Iran, India where folks have lived normal lives for countless generations with radiation levels as much as a hundred times greater than the forbidden areas of the Fukushima homes." The author of the article is saying people have lived happily in those areas with radiation levels exceeding 90 sieverts per year, then. That should be news to those people. In a location in Okuma-machi, within 3 kilometers from the stricken plant, the air radiation level at 1 meter off the ground was 103.66 microsieverts/hour according to the measurement conducted by the town on September 13 and 14. The cumulative annual radiation exposure, if simply multiplying this number by 24 (per day) and then by 365, would be 908 millisieverts. The author also seems to think nothing of the fact that people in Fukushima have lived there for generations with a low radiation level. The national average for Japan was 1.4 - 1.5 millisievert per year. Not to mention that many "good people" in those high-radiation 20-kilometer radius areas in Fukushima DO NOT want to go back. I became fearful that Dr. Rockwell might soon launch into radioactive potassium in bananas, so I stopped reading. But here it is, for your perusal. The front-page story in the Washington Post on Sunday November 20 vividly portrayed the horrors of the evacuated zones around Fukushima with unforgettable imagery. A natural reaction is to call for more restrictive safety measures. But one point was not made clear: No one, not one single person, has received a life-altering injury from radiation since the disaster started unfolding last March. The atrocities described are caused by the application of international radiation standards that are set at levels far below where science shows adverse health effects occur, and by the fear of radiation that policy creates and nurtures. Once again, fear of radiation does more harm that the radiation itself. The reality is that, while some people in the Fukushima housing area are wearing cumbersome rad-con suits, filtered gas-masks, gloves and booties, and putting the same on their children, other people are living carefree in places like Norway, Brazil, Iran, India where folks have lived normal lives for countless generations with radiation levels as much as a hundred times greater than the forbidden areas of the Fukushima homes. The use of inappropriate radiation standards is not an abstract issue. People around Fukushima are being told they cannot return home for an indeterminate period -- perhaps years. And efforts to decontaminate their home sites to these standards may include stripping off all the rich top-soil and calling it RadWaste. People who were evacuated have been reduced to economic poverty, clinical depression, and even suicide. There is good scientific evidence that, except for some hot spots, the radiation levels at these home-sites are not life-threatening. The current restrictions are based on a misguided desire to be "prudent." No matter how well intended, this "prudence" is cruelly destructive. Many radiation protectionists, such as Myron Pollycove, MD, former special assistant to the U.S. Nuclear Regulatory Commission, Dr. Jerry Cuttler, former President of the Canadian Nuclear Society, and Abel Gonzales of Brazil, vice-chair of the International Commission on Radiological Protection, are beginning to feel unhappy about the harm their rules have caused and are joining in the cry for quick action as the Japanese head into winter. In 2002, U.S. Regulatory Report NCRP-136 examined the question of establishing permissible radiation limits. After looking at the data, it concluded that most people who get a small dose of nuclear radiation are not harmed by it, and in fact are benefited. That's what the science said: Most people would benefit by receiving more radiation, within the hormetic range. "Benefit" means the incidence of cancer and genetic damage would be less than it would be without the additional radiation. But curiously, the report's final conclusion was just the opposite. It recommended that our regulations should be based on the unsupported premise that any amount of radiation, no matter how small, should be considered harmful. It justified that recommendation as "conservative" or "prudent." Let's think about that. Why is it prudent do just the opposite of what the science indicates? Why is exaggerating a panicky situation considered prudent? I've never seen a good answer to that. Last month, British radiation expert Wade Allison, author of Radiation and Reason, addressed the people on Japanese television. He proposed that radiation limits be set the same way other such limits are set -- not by seeing how little we can obtain, but what is the maximum we can tolerate, including a generous safety factor. The answer he gets is about 1,000 times the current "permissible limit." Who gave the radiation police the right to give their particular concern priority over all other considerations? That question is not limited to Japan. A proposed European Community directive dated 17 Oct 2011 notes that the doses of radiation being regulated are small compared to doses people receive in the normal course of living. Instead of reaching the common-sense conclusion that they should therefore stop trying to regulate harmless doses of radiation, they decided they have to regulate Nature! They want us to wage an endless war against our naturally radioactive planet, when there is good evidence that without radiation, Life withers and dies. Few if any people decide where to live, or how to live, on the basis of radiation level. There is no reason that they should start doing so now. Let the good people of Fukushima return home and get on with their lives! Oh I see. The author does quote Dr. Allison. The person in charge [at the Ministry of Health and Labor] says about the safety of the powdered milk that has been found with 30 becquerels/kg [of radioactive cesium], "It will be further diluted when consumed. It can be said that there will be no effect on health." Oh is that so? Are you sure? A 6-month old baby drinks 4 cans of powdered milk per month, I was told. The net weight of a can of Meiji Step milk is 850 grams, so the baby would consume 3.4 kilograms (850 grams x 4) of the powdered milk per month. 3.4 kilograms of the powdered milk would contain 102 becquerels of radioactive cesium (30 becquerels/kg x 3.4). The baby would be fed with 3.4 becquerels of radioactive cesium per day. That would be 34 to 340 times more than the pre-Fukushima accident level of radioactive cesium intake per person per day. But bureaucrats at the Ministry of Health are confident. No effect on health. One expert chimes in with his tweet, saying "We shouldn't be hurting the feelings of mothers who have fed their babies with this formula by making a big deal out of it. We shouldn't make them feel worried or regret". He continues by implying the amount of radioactive cesium is too small to cause any effect. Here you go (and AP, and Washington Post, and...). 150 liters of this radioactive strontium-rich water leaked into the ocean from the evaporative condensation apparatus (part of the contaminated water treatment system), via the regular drains. Total amount of radioactive materials (including cesium) that leaked into the ocean this time: 26,000,000,000 becquerels, or 26 billion becquerels. TEPCO says it is 12% of "annual discharge target control of radioactive liquid waste" at Fukushima I Nuclear Power Plant. That's one way of putting it. Another way is that it is only a fraction of what has already been discharged, to the tune of between 4,700 terabecquerels (TEPCO estimate so far, though the company was to recalculate by the end of November; did it?) and 27,100 terabecquerels (France's IRSN estimate), and these numbers do not include strontium. In the press release appendix below, the numbers in ( ) is the total amount of these radionuclides that flowed into the ocean. For my previous post on this topic, go here and here (more pics). By the way, the numbers for strontium and other beta nuclides in the contaminated/treated water were released on November 18 by TEPCO. The mention of radioactive strontium was made during the press conference on December 4. The manufacturer will replace 400,000 cans of its baby formula free of charge. The brand that radioactive cesium has been found is "Meiji Step", a formula designed for infants 9 months and older. As the article by Sponichi below states, Meiji is the largest manufacturer of baby formulas with 40% market share. Meiji did its own testing and disclosed the number. Will other makers follow suit? "Meiji Step", a baby formula manufactured and sold by Meiji (headquartered in Tokyo), one of the largest food manufacturers in Japan, has been found with the maximum 30.8 becquerels/kg of radioactive cesium by the company's testing. It is not known how radioactive cesium was mixed in, but the company thinks it is due to the Fukushima I Nuclear Power Plant accident. According to the Ministry of Health and Labor, it is the first time that radioactive cesium is found in the baby formula, after the nuclear plant accident. Meiji will replace about 400,000 cans free of charge. The level of radioactive cesium is below the provisional safety limit by the national government for baby formula (200 becquerels/kg). It has been pointed out that infants are more susceptible to the effect of radioactive materials than adults, and the Ministry of Health and Labor is to set the new standard for "baby foods". According to Meiji, the effective dates of the baby formula that has been found with radioactive cesium are: October 4, October 21, October 22, and October 24, 2012. The effective date is on the bottom of the can. 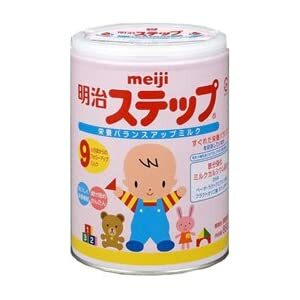 Meiji is the largest manufacturer of baby formulas in Japan, with about 40% market share. According to Meiji, 400,000 cans of the formula were processed in Meiji's factory in Kasukabe City in Saitama Prefecture, whereby the milk was dried between March 14 to 20. The raw milk came from Hokkaido, which was processed before March 11. The company thinks that during the process to air the milk to dry, airborne radioactive cesium released from the Fukushima I Nuclear Power Plant accident was mixed in. So, Meiji was manufacturing powdered milk in the worst possible period. March 14 was when Reactor 3 blew up. Reactor 4 blew up (or made a loud noise and smoke was observed, according to TEPCO) the next day, and something really bad happened in the Suppression Chamber of Reactor 2, though no one says what it was. 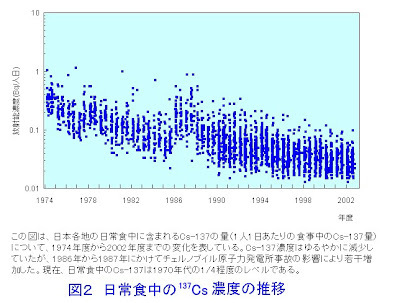 And still unexplained events happened on March 20 that spiked the radiation levels all over Tohoku and Kanto. And the company was airing the raw milk, without knowing the radioactive plume was hitting wide areas in eastern Japan. The government knew. Many nuclear experts and researchers knew. No one bothered to tell the public. Some were threatened with termination or end of their careers. Some say they feared for widespread panic. Yet others were just collecting data so that they would be able to publish in a prestigious magazine several months later. Actually, I don't know if there's anything else I could expect from a company that used bath salts as tracer and newspaper and sawdust to stop the water leak back in April. The next task would be to mop up the water that's sitting inside the building for the evaporative condensation apparatus with diapers and make Packbots pick up the diapers after they soak up water with 100,000 becquerels/cubic centimeter of strontium. As far as I know, this building for the apparatus was built recently. But the side of the concrete foundation has already cracked? Some workmanship. Oh look! TEPCO is way ahead of me. Inside the sandbagged area, they have already put down what looks like sheets of water-absorbing polymer. In a very hasty, haphazard way. I guess you don't want to stay near 110 millisieverts/hour beta radiation very long. University Researchers: Let's Dump Contaminated Soil into the Ocean! Scholars who participated in the Ministry of Education's radiation mapping are proposing dumping the contaminated soil removed as the result of utterly useless "decontamination" efforts into the depth of the Pacific Ocean, 2000 meters deep. And don't worry, the researchers did propose putting the soil in containers first. An idea has surfaced among researchers to dump the soil contaminated by the Fukushima I Nuclear Power Plant accident into the ocean, as it is difficult to secure the storage space to store the soil removed in decontamination efforts. The idea will certainly be greeted with strong criticism from the public both domestic and international, but the researchers plan to propose it to the national government as one of the practical solutions. Decontamination is the responsibility of the national government in the areas where the annual cumulative radiation exposure would exceed 1 millisievert. The plan is to scrape off the top soil, store it in the temporary storage areas in the affected municipalities, and then transport it to an intermediary storage facility to be built somewhere in Fukushima Prefecture. It is expected that 15 to 31 million cubic meters of contaminated soil will be removed within the prefecture. If the final disposal plan remains undecided, the intermediary storage could become permanent. The government hasn't secured the land to create the intermediary storage facility. Considering this situation, a group of researchers who participated in the soil contamination mapping by the Ministry of Education and Science, including Professor Isao Tanihata of Osaka University Research Center for Nuclear Physics and Professor Koji Nakai of Tokyo University of Science, proposed the deep sea solution in a workshop held on December 3 at Osaka University. The best method, according to the group, would be to put the contaminated soil in containers that would withstand corrosion and high water pressure, and sink the containers in the coastal water more than 2000 meters deep. AP decided to focus only on relatively small numbers for radioactive cesium in the 45 tonnes of water that was found leaking from the evaporative condensation apparatus at Fukushima I Nuclear Power Plant on Sunday. No mention of strontium, 100,000 becquerels/cubic centimeter or 100 million becquerels/liter, anywhere. TOKYO — Japan’s crippled nuclear power plant leaked about 45 tons of highly radioactive water from a purification device over the weekend, its operator said, and some may have drained into the ocean. The leak is a reminder of the difficulties facing Tokyo Electric Power Co. as it tries to meet its goal of bringing the tsunami-damaged Fukushima Dai-ichi nuclear power plant to a cold shutdown by year’s end. pool of radioactive water was discovered midday Sunday around a decontamination device, TEPCO said in a statement on its website. After the equipment was turned off, the leak appeared to stop. Later, workers found a crack in a concrete barrier leaking the contaminated water into a gutter that leads to the ocean. TEPCO estimated about 300 liters leaked out before the crack was blocked with sandbags. Officials were checking whether any water had reached the nearby ocean. The leakage of radioactive water from the Fukushima plant into the Pacific Ocean in the weeks after the March 11 accident caused widespread concern that seafood in the coastal waters would be contaminated. The pooled water around the purification device was measured Sunday at 16,000 bequerels per liter of cesium-134, and 29,000 bequerels per liter of cesium-137, TEPCO said. That’s 270 times and 322 times higher, respectively, than government safety limits, according to the Citizens’ Nuclear Information Center in Tokyo. Cesium-137 is dangerous because it can last for decades in the environment, releasing cancer-causing radiation. The half-life of cesium-134 is about two years, while the half-life of cesium-137 is about 30 years. TEPCO is using the purification devices to decontaminate water that has been cooling the reactors. Three of the plant’s reactor cores mostly melted down when the March 11 tsunami knocked out the plant’s cooling system. Despite the protest from the milk industry and the milk distributors, Chiyoda-ku, one of the 23 Special Wards in Tokyo, conducted the analysis of the food served in the school lunches at elementary schools, middle schools, kindergartens and nursery schools in the ward. At one private nursery school, 17.9 becquerels/kg of radioactive cesium was detected. Chiyoda-ku measured the entire cooked lunch at each school. It is not known if this radioactive milk was already served and consumed when they tested. While that may not much (45 tonnes), the water may contain extremely high levels of beta-nuclides like strontium; according to TEPCO, the density of strontium could be as high as 100,000 becquerels per cubic centimeter. That's 100 million becquerels per liter. The leak was found at the post-Kurion/SARRY treatment facility that condenses the treated water (TEPCO calls it "evaporative condensation apparatus). Here's TEPCO's handout for the press on December 4, 2011. TEPCO announced on December 4 that about 45 tonnes of contaminated water leaked at the water treatment facility at Fukushima I Nuclear Power Plant and part of the water has leaked outside the facility. The water may have gone into the drains and leaked into the ocean, according to TEPCO, but "It would be a small amount even if the water had leaked, and very little effect [on marine life]", says the company. The leak was found at the evaporative condensation facility, which the water goes after being treated to remove radioactive cesium [Kurion and SARRY]. The leaked water is 5 centimeter deep inside the facility. On the surface of the water, the radiation level measuring gamma rays is 1.8 millisievert/hr, but it is 110 millisieverts/hr measuring beta rays. In order to mop up the water in the facility, the workers would have to do it without coming in contact with the water to avoid exposure to beta-ray radiation. According to TEPCO, 100,000 becquerels/cubic centimeter of strontium, a beta nuclide, may be in the water. The level is 100,000 to 1 million times the safety limit for seawater.